Rooftop solar panels help generate energy for The Oaks. In total, a 73kW solar panel array was installed on the homes and over the carport and will generate approximately 100% of the neighborhood’s energy needs. 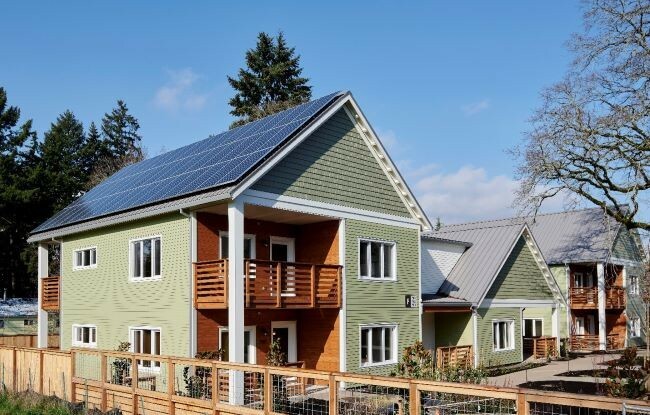 Last month’s celebration of the opening of The Oaks at Rose Villa, Portland’s first zero-energy senior living community, received a lot of attention from residents, the community and the media. It got us thinking that some people may not be aware of the definition of zero energy, or why that is now the preferred terminology over net zero energy. Rose Villa caught up with Erica Dunn, Director of Design with Green Hammer, the design/build firm behind The Oaks, to answer a few questions about living zero energy. RV: At its basic, what does zero energy mean? ED: Zero-energy at its basis means a building produces enough renewable energy (typically through solar panels) on site to meet all of its energy needs. The goal of living in a zero-energy home is that you only use as much energy as you can produce on-site over the course of a year. To do this, you can either use an on-site battery to store energy for use when there is not enough sun (night or winter) to meet your needs (often called “off the grid”) or you can be “grid tied” and be connected to the municipal power grid and either “buy” energy when you aren’t producing enough or “sell” energy when you are overproducing – essentially using the power grid as a battery. RV: What is the difference between net zero and zero energy? ED: They are essentially the same idea - that over the course of a year you are producing as much energy as you are using. However, calling something “Net Zero” adds a layer of complexity and can make it difficult for people to grasp the idea of Zero Energy quickly and easily and see the excitement of a zero-energy project. By dropping the “net,” it removes the math geekiness of the concept and helps people understand that it just means we build to balance use and output. RV: So net zero and zero energy are the same, it’s just a marketing distinction? ED: Depends on who you talk to, but primarily, yes. RV: What about the “Path to Net Zero?” What does that mean? ED: This is a program through the Energy Trust of Oregon, which, through state legislation, tariffs, and other requirements, is funded by customers of Portland General Electric, Pacific Power, NW Natural, Cascade Natural Gas, and Avista. Projects that incorporate certain energy efficiency measures are eligible for incentives. RV: The Oaks homes were built to Passive House standards. Can you tell me more about that? ED: Passive House is a third-party certification. It’s basically a method of creating a very low energy use building. If we want to get to zero, and we only have so much room for solar panels on the roof of our buildings, we have to create other efficiencies, such as a building envelope with higher levels of insulation and high-performance triple-paned windows. These measures reduce the energy needs of the building and allow us to use minimal space conditioning systems to keep the buildings comfortable. RV: Anything else we should know about zero energy homes? 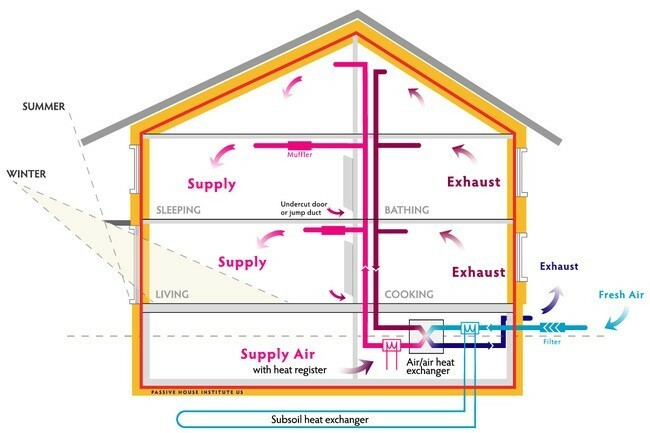 ED: Zero-energy homes are not only great for reducing our impact on the environment but, because they incorporate better construction practices, they are also thermally more comfortable, quieter, and have healthier indoor air quality than standard construction. It’s a win-win for the environment and the residents. Beans, beans, the magical fruit. Science Got You Seeing Red? Three Myths About Senior Living Communities, Debunked! High Overhead at Rose Villa! Join us for an upcoming event and see everything life can be. Rose Villa welcomes Julie Green as part of our Visiting Artist Series. The day to day drudgery of home upkeep - leave it to us. Healthcare worries - leave it to us. Financial security - leave it to us. Free yourself up to do the things YOU LOVE! Click the button below or call 503-652-4001 to RSVP. 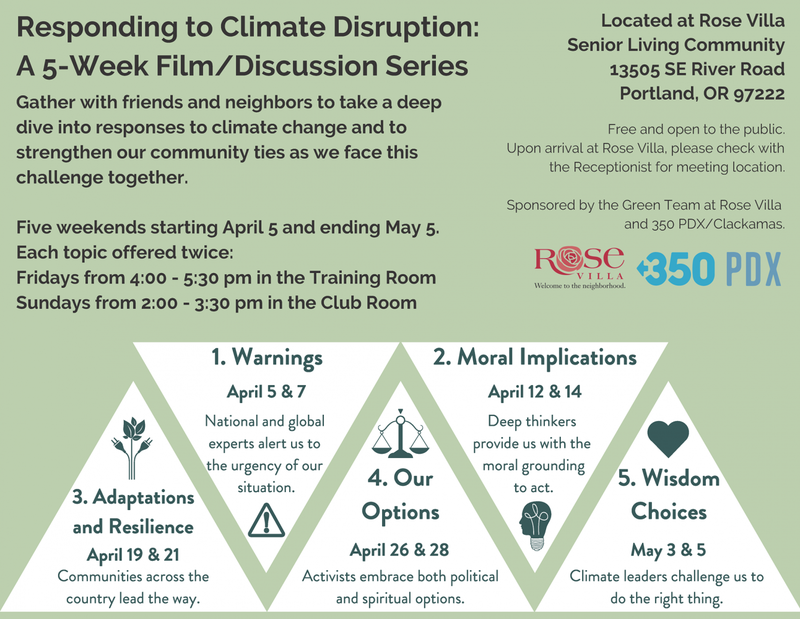 Responding to Climate Disruption: a five-week film/discussion series. May 5, 2019 – 4:00pm to 5:30pmCheck with reception for meeting location. Learn tips to take the stress out of moving! Certified Professional Organizer® Anne M. Blumer, will be sharing easy-to-follow advice to help take the stress and worry out of downsizing. No cost to attend, light refreshments will be served. Guests are welcome to take a tour of Rose Villa following the event. Bolivia Carmichaels, Honey Bea Hart, Onyx Valentine, and Alexis Campbell Starr return to Rose Villa for an encore Halloween Drag Queen Show! These female impersonators have headlined at venues in Portland and across the country, including the Portland Center for Performing Arts. Join us for a night of dance, comedy, and impersonation. Cash-only bar with beer and wine, charges to Rose Villa accounts for beverages will not be available. NET ZERO NEIGHBORHOOD IS FIRST OF ITS KIND. CLICK TO LEARN ABOUT OUR NEW PHASE 2 HOMES!